How the model for Israeli beauty has morphed over the decades and come to look a whole lot like American beauty. The phrase “Israeli beauty” is common in Hebrew. It is used to describe everything from the Israeli landscape and Israeli flower production to “good” Israeli citizens and cosmetics from the Dead Sea. Listening to the media and how often the phrase is used, you may believe you’ve entered a very special country—one that highly appreciates beauty and celebrates it every day, everywhere. But what does “Israeli beauty” mean when it comes to girls and women? Currently, it’s pretty similar to the beauty ideals of the United States. Israeli girls play with Barbie and Bratz dolls, watch Nickelodeon, and insist on wearing American clothing brands (expensive and highly valued). When they tune into Israeli television, they are pummeled with the overblown importance of beauty. In fact, just like in the United States, faces of celebrities plaster the media and daily gossip is widely spread in newspapers. Last year, for instance, when Ninet, the winner of the singing competition A Star is Born (Israeli version of American Idol), got a new hair cut, it made the front page of every popular newspaper in Israel. Israeli models, young singers, dancers, and even ambassadors are “discovered” here, too, due to a slew of reality TV shows inspired by programs on American television. For my daughter’s fifth birthday celebration five years ago, we had an ice cream party with all of her friends. We had a lot of fun (and ice cream) until one of the girls asked where the diet ice cream was. She explained to me and her tiny friends that she must watch her weight if she wants to be beautiful. This obsession with appearance among my daughter’s classmates continues to worsen. Half of the class cut their hair to mimic Ninet’s style. They constantly spend money on the right brand of clothing, and every day of school feels like a fashion competition. Most of the girls use a variety of cosmetics to protect their youthful beauty. They are ten years old. Israeli beauty wasn’t always defined by American standards. In the nineteenth century, Zionists saw the European Jews as degenerate and wished to create a whole “new Jew.” This new Jew was supposed to be healthy in body and mind. He/she was always illustrated as tall, comfortable with his/her body, and larger than life. The Zionist icons were attractive inside and out. Later, during the Yishuv period (before the State of Israel was established), there was a real cultural war over Israeli beauty. Who was more beautiful—the halutsa (pioneer) women from the kibbutz or the sophisticated urban women? 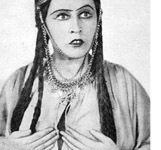 Shoshana Damari (the Yemenite national singer hugely popular before and after the founding of the State of Israel) or Chana Robina (the nonconformist actress recognized as the original “First Lady of Hebrew Theater”)? Damari appeared exotic, wearing huge amounts of Yemenite jewelry. Robina was larger than life; she was fair-skinned, dramatic, and involved in a tragic love affair with a local poet. This cultural war was about creating a new look—removing the early Zionist images while maintaining a clear distinction from the Arab enemies. Women could not look too Ashkenazi (European Jew) or too Mizrahi (Eastern Jew, descended from the Middle East). The new ideal strived to demonstrate the socialist values of the ruling Labor party, but at the same time eliminate “dangerous” social trends such as liberalism or female independence. They were supposed to look like working women. In the early 1950s, the independent left-wing magazine H’aolam H’aze (This world) held the first beauty contest in Israel. The winner, Ofira (who later married the Israeli president Yithchak Navon), became Israel’s first beauty celebrity. She was tall, suntanned, and had long dark hair. Her beauty was looked upon as “very Israeli”—not too pale, not too dark. Her smile became a symbol of the Israeli-born girl—both beautiful and nationally committed. Since that time, there have been several beauty contests each year. However, the quest to define what made an Israeli woman “beautiful” was largely neglected. Television, appearing in Israel only in 1969, introduced new powerful images from America, and Israeli women tried their best to follow their American sisters. The Israeli march toward the American dream began. Individualism replaced the Zionist type of socialism. Suddenly, anything imported was considered good and beautiful; anything domestic was considered less. The mass immigration of the 1990s brought many new and diverse women to the country. Over one million immigrants from the former USSR and Ethiopia enriched the multicultural make-up of Israel. You would think this might have shifted the idea of what beauty looks like. Sadly, it has not. Maybe it is because the new immigrants have maintained a separate cultural identity and have not submerged themselves in the Israeli melting pot. Consequently, though the American model is extremely strong, there really is no defined “Israeli beauty,” and maybe it is better that way. Maybe Israel will finally find its way to a new standard of beauty. Perhaps we can open our eyes to the beauty of a multicultural society. Moreover, I hope that one day Americans will do the same.